Visitors to the Olive House will be received at the port or airport by Ramona, our wonderful on-island concierge. She is a multi-lingual native of Paros, and will introduce you to the house and share her knowledge of the sights and secrets of Paros. Although you will have complete privacy during your stay, assistance or advice will only be a phone call away. 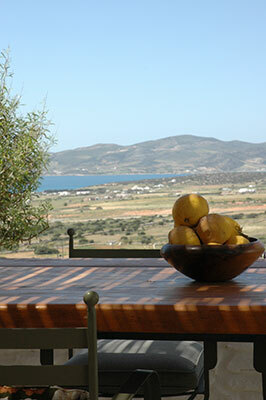 We aim to make you as comfortable as we can, while also granting you access to real Greek island life. For example, during the fall season, guests will be invited to join in olive picking and the grape harvest. As a service to our guests, we stock the villa with Korres natural bath products, filtered drinking water, and complimentary arrival treats like wine, beer, soda, coffee, tea, fresh fruit, cheese and bread. Firewood is also provided during the colder seasons. We are happy to organize any additional provisions you may need; those requests and fee quotes are handled at the time of booking. We provide weekly maid service as part of the rental. Daily service can be organized for an additional fee, and we can also recommend a local chef or babysitter for you to hire should you need one.